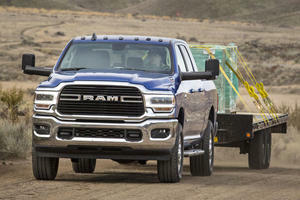 The RAM 2500 is a no-nonsense, heavy-duty workhorse. It’s one of those that you will be buying to fulfill a purpose as opposed to making you feel good. The pricing is something to keep an eye on; the RAM 2500 starts off at $32,145 and that’s decent for a truck of this caliber, but that’s also a better optioned and not much smaller RAM 1500. At least 45 trim and styling options are available in various combinations and ticking all the boxes can get you up to as much as nearly $70,000, but at that level it should be working to pay for itself. If the entry RAM 1500 truck isn’t enough for your needs, there’s the option of the RAM2500 that falls in the middle of the RAM truck offerings. 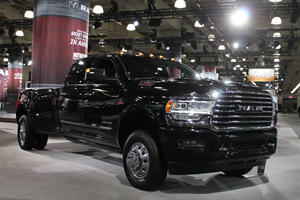 This popular offering from Dodge is a good-looking, intimidating truck and it starts off at a cool $33,245. This one will trump the 1500 in size and weight, but also in towing capacity. It’s a good but for a small to medium business, and with the Texas Auto Writer’s Association naming the truck as the Heavy Duty Pickup Truck of Texas two year in a row. What does that title get you in a RAM truck? A lot. 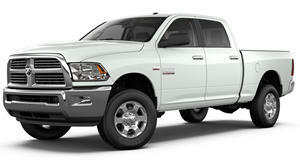 With different cab sizes you still for the RAM 2500 you’d expect different interiors, but they’re all remarkably similar. Appointments are, as you’d expect in a truck that’s primarily aimed at certain types of work, not too plentiful, but there are enough things to make the comfort and convenience more than up to the task of a daily driver. Finishings can be tailored for more comfort in some models, so leather seating and an upgraded audio system is available. The seating is the same as in the 1500, and it can be adjusted enough to get you into the perfect seating position. Depending on the trim optioned, you can find hard and soft plastics, aluminum and wood trimmings and heavy-duty carpeting. Space is great; six burly adults will barely fill a crew cab. The RAM 2500 is the midfield option when looking at the RAM truck range, but it offers up a drive that’s basically the same as with its smaller sibling, the 1500. It does have a bit more weight to it which can be felt on longer corners or when trying to bring the sizeable truck to a halt. Things are smooth when it comes to the operation of the engine and gearbox, but when the truck is made to take heavier weights on the load bin you can expect stiffer springs, and that translates into a harsher ride. The seating is comfortable and helps negate this to a point. For when loads are at a maximum, there are options like self-leveling suspension to make the long haul more comfortable. Parking and navigating tight bends is not fun, especially in a model like the Laramie Longhorn that measures in at almost 21 feet. As far as performance goes for the RAM 2500 truck, buyers can option the truck with a few powerplants including a 5.7-liter V8 HEMI with 383 hp and 400 lb-ft of torque, a 6.4-liter V8 HEMI with 410 hp and 429 lb-ft of torque or the massive 6.7-liter turbo diesel from Cummins that kicks out a best in class 370 hp with up to 800 lb-ft of torque. They’re all good engines, and the more you need to tow and haul, the bigger you’d need to go, but for most applications the 5.7-liter should be ample. Transmissions include a 6-speed manual (with Cummins only) or a 6-speed automatic for all other occasions. If it’s hauling you need to do, the diesel option allows up to 17,980 lbs. Inside the utilitarian cabin you can find all the usual bells and whistles and that puts it on par with the other RAM trucks as well as what the competition offers. Remote keyless entry, cruise control, voice commands and Bluetooth for the infotainment system are in play as standard in may model variations, but you can option extras like a biggest in class 8.4-inch touch screen, navigation and even the tech to turn the RAM into a Wi-Fi hotspot. Parking assist systems are there to help, and things like hill descent control, electronic stability control and a tire pressure monitoring system add to the safety along with an array of airbags. The RAM 2500 is good, but you need to be sure that you know what you’re buying one for. If you want a truck to have a truck, then the smaller 1500 are likely a better option for you, but if you need a dedicated hauler that you can use and abuse, then the 2500 is worthy of your consideration. 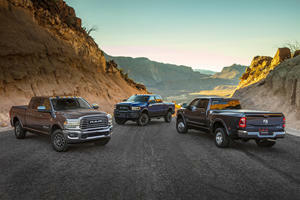 Pricing and features align the truck with competitors, but choosing a RAM over a Silverado or F150 will in all likelihood come down to availability and special deals to attract buyers. Time to celebrate 145 years of that famous horse race. The trucks at night are big and bright deep in the heart of Texas. So how does it stack up to the Heavy Duty competition?